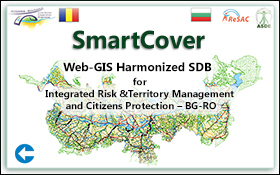 The Agency for Sustainable Development and Eurointegration - ECOREGIONS (ASDE) is a partner № 9 in the flagship project "SPATIAL" - Common Strategy for sustainable territorial development of the cross-border area RO-BG (MIS ETC CODE 171). The project is realized within the framework of the Cross-Border Cooperation Program between Bulgaria and Romania (CBC – RO-BG). Lead Partner is the Ministry of Regional Development and Public Administration of Romania, the coordination from Bulgarian side is managed by the Ministry of Regional Development of Bulgaria - Partner 2. The main result of the project is the establishment of a common comprehensive spatial database, which is the first of its kind in the EU. It is a cross-border common geo-database, integrated and harmonized, in accordance with Directive 02/2007/EO-INSPIRE and based on the reference land cover layer in the new global standard ISO 19144-2 (LCML), as well as on Land Parcel Identification System (LPIS) best practices. The Cross-border database is implemented on an innovative open source platform - Smart Architecture geo- portal and oriented to ensure fast and efficient services to end users. In the process of development of the cross-border database and geo- portal, besides the project partners, ASDE worked closely with experts from the European Commission - DG JRC-IES - MARS UNIT. Particular importance has the proposal of ASDE in the draft common strategy for territorial development executive structure - Regional Centre for Integrated Risk and Territory Management of the region of the Lower Danube (RCIMRT), which is responsible for the overall coordination of the implementation of future cross-border strategy, maintenance of the reference land cover layer and the regular monitoring of the changes (changes detection) to the sustainable management of risk and territory. This structure is a realization of the decision of the Council of Ministers of Bulgaria , Protocol 29 of 24.06.2013 , as well as of the adopted and approved Integrated plan for urban regeneration and development of the city of Ruse – developed under the Operational Program "Regional Development 2007-2013" (161b 0001/1.4-07/2010/001). Additional information on the project SPATIAL can be found at SPATIAL-CBC.EU.